Rachel Taylor has survived so many tragedies in her life, what’s one more? But when Hurricane Gabriel takes aim at her house, ruining practically everything, she’s not sure this one won’t take her out completely. With two small children and no husband, she knows she has no choice but to accept the generosity of Derek West and his television construction crew. However, Derek isn’t in charge of this one. Caleb James is, and Rachel’s world is about to be rocked to the foundations by this handsome, wonderful, big-hearted construction guy. The problem is, too many tragedies have taught her to not trust any good thing. Can she get her house back in one piece and keep her heart that way too? Caleb James was not planning to be point person in front of and behind the camera, but when his boss, Derek West finds himself stretched in too many directions trying to help the people of Ridgemount clean up after the hurricane, Caleb has to step into the limelight to help out. Of course, he’s always kind of wondered what being the head of his own crew might be like, but with Derek on-set, the chances of him getting his big break have always been slim-to-none. Then, without warning, he’s in front of the camera, and his big break may just have found him. But even as he tries to navigate this new way of life, he finds himself attracted to and then falling for the home owner, a young widow with two small children who have stolen his heart. Unfortunately, his line of work is all about moving on when one project is finished. Which one will he choose, his dream job or his love for a woman who may never be able to love him back? The third book in THE GRACE SERIES, “A Love Like This” asks the reader to go on a journey with two souls who are learning to love in a way the world says no longer works. 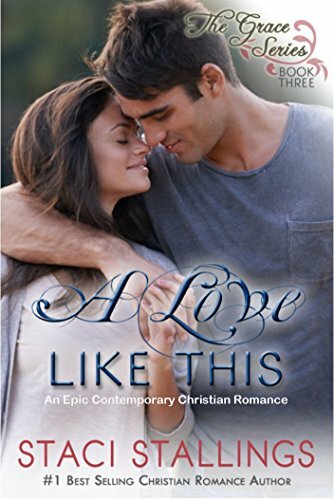 This Contemporary Christian Romance will leave you cheering, crying, laughing, and hoping for a young woman who has been crushed and a guy who never knew love could be so difficult. Come along for this inspirational journey. It is one you won’t soon forget!